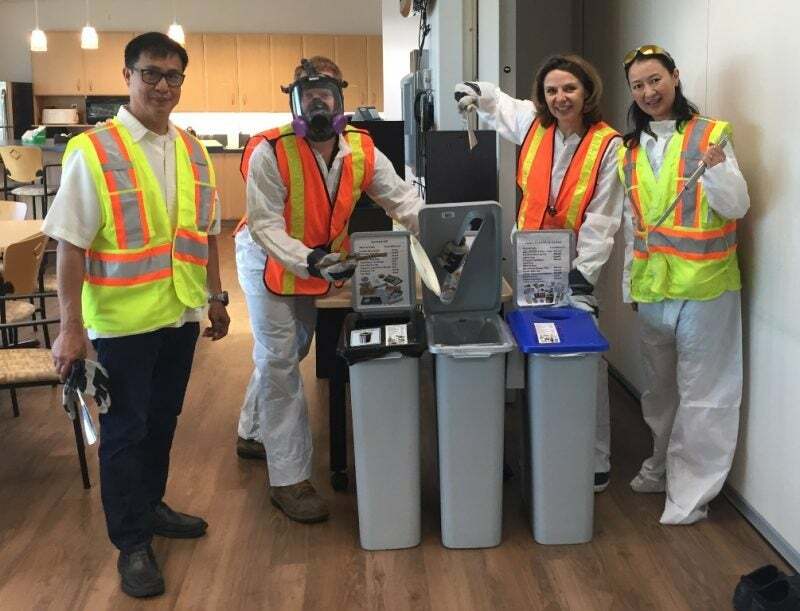 With the addition of Clorox Canada’s Biscayne office, Clorox now has nine Zero-Waste-to-Landfill (ZWtL) locations. Each site has taken its own journey to ZWtL. Because Biscayne is the first Clorox office to be certified ZWtL, it had to solve some unique problems to meet all three of our zero-waste criteria: 90 percent of all material generated is reused, recycled, or composted; the remaining 10 percent or less is used as a fuel; and passing a corporate audit. Clorox Biscayne’s “ACE team” (Awareness and Care for the Environment), led by Christine Jackson, decided work toward ZWtL over a year ago. 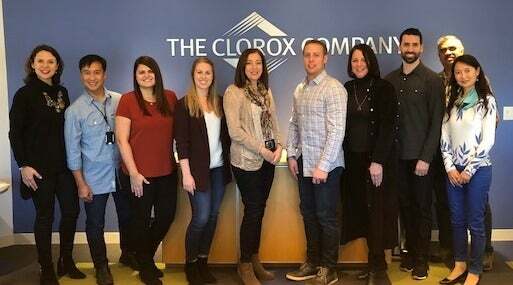 “We have a dedicated group of employees who really wanted to be the first ZWtL Office in the Clorox network” said Christine, Canada’s National Training and Business Development Manager. Members of the Clorox Biscayne’s ACE team. Pictured (l-r): Christine Jackson, Ray Viloria, Lejla Fabro, Laura Peden, Ann Marie Cicuttini, Nicholas Gil, Julie Hall, Michael Lesperance, Wilfred Fernandes, Laura Tan. Not pictured: Anna Wrona, Chelsea Broderick, Matt Adams, Matt Kohler. The first challenge was to determine what waste we produced in an office environment by doing a waste audit, said Ray Viloria, Facilities Manager. The team found a local recycler to remove the office waste and weigh it each week. The team then provided monthly diversion reports to all office staff so everyone could track progress toward the ZWtL goal. It also sent regular reminder emails with pictures of misplaced trash. Another key move was establishing a stronger partnership with the facility cleaning staff and educating them on the Clorox ZWtL initiative. To ensure proper recycling and waste disposal, the ACE team set up dedicated, color-coded cans for compost, recycling and landfill waste. The Clorox Creative Services team helped develop site-specific “What Goes Where” signs, which were posted above the bins and on the top of each bin for easy reference. These were modified several times to add items and simplify the graphics, and also because of the changes in the recycling market. According to Christine, “It took several months to work out kinks with the recycler, revise signs and educate employees to improve our recycling rate, but we were finally ready for our ZWtL in July”. Members of the Clorox Biscayne ACE team with color-coded bins to aid proper waste sorting and disposal. Biscayne demonstrated that more than 92 percent of its waste was being recycled or sent for composting over a six month period, with the remaining waste being sent to a waste-to-energy plant in Buffalo, New York. Biscayne passed its audit becoming the first official ZWtL Office in the Clorox network, and the first ZWtL site of fiscal year 2019. Please join me in congratulating Clorox’s Biscayne Office as the newest ZWtL facilities in the Clorox Network. We have just one more location to go in order to achieve our 2020 ZWtL Goal. Let’s see if we can’t exceed that goal. 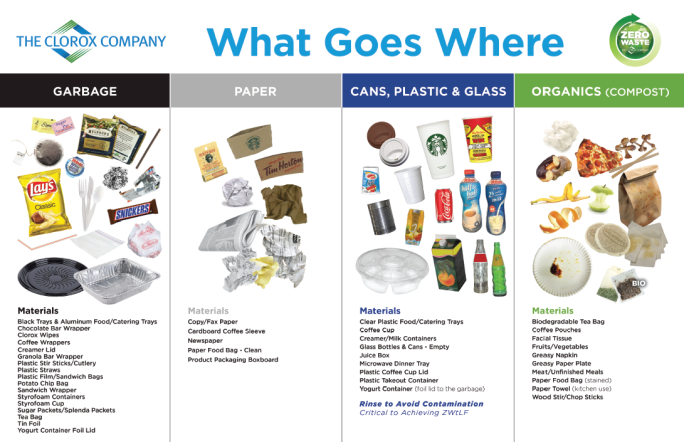 Waste-sorting graphics designed by Clorox Creative Services.